Not to be confused with pendent, pennant, or pedant. 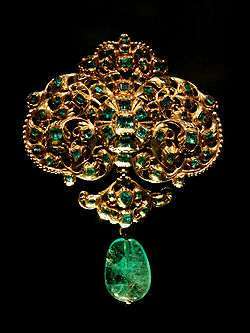 One of the earliest types of bodily adornment is a pendant, (a hanging ornament, as an earring or the main piece suspended from a necklace.) Attractive rocks Shells and other indigenous materials were used. In Ancient Egypt, Pharaohs normally wore scarab beetle pendants to symbolize their wealth and power. 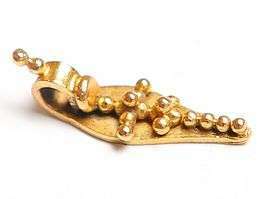 Royalty and nobility in Ancient Egypt also wore a certain type of pendant called a cartouche. 1 2 "The Early Pendant: A Jewelry And A Talisman". Talismanamulet.org. Retrieved 7 August 2012. 1 2 Johns, Catherine (1996). 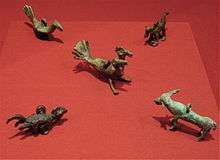 The Jewellery of Roman Britain Celtic and classical Traditions. Routledge. p. 104. ISBN 9780415516129. ↑ "amulet". The Columbia Encyclopedia (6th ed.). Encyclopedia.com. 2014. Retrieved 27 October 2014. ↑ "Talisman". Encyclopedia of Occultism and Parapsychology. Encyclopedia.com. 2001. Retrieved 27 October 2014. ↑ Luscomb, Sally. The Collector's Encyclopedia of Buttons. Atglen, PA: Schiffer. p. 242. ISBN 0-7643-1815-2. ↑ "Medal". The Columbia Encyclopedia. Encyclopedia.com. 2014. Retrieved 27 October 2014. ↑ Yamamoto, Mike (1 February 2007). "USB as fashion statement". CNet. Retrieved 3 October 2013. ↑ Yamamoto, Mike (11 June 2007). "The hot trend in designer jewelry: USB keys". CNet. Retrieved 3 October 2013.